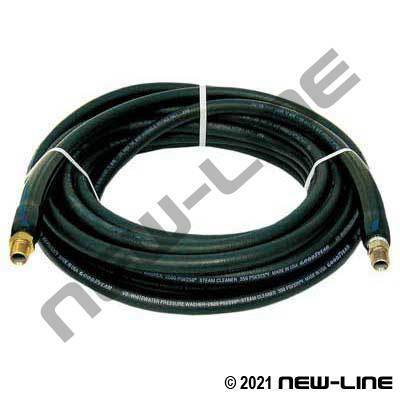 NL720 is designed for use on either steam cleaner machines or a combination of steam cleaner/pressure washer machines. Its tube compound has been re formulated for improved fitting retention and better durability in hot & cold water impulse applications. It will handle steam up to 3250F @ 350 psi with a safety factor in excess of 10:1. It will also handle hot water up to 2500F @ 3000 psi with a 4:1 safety factor. Its tube and cover are resistant to the chemicals used in the pressure washing and steam cleaning markets. Popular assemblies are listed below; any non-stock assemblies can be made up from our bulk inventory. Typical Fittings: 1A-FJ Series permanent "through-the-cover" crimp fittings (DO NOT use male NPT swivel ends as the steam will degrade the O-ring and eventually leak), NL735 bend restrictors or rubber heater/radiator hose (NL730 may soften under high temperatures), ST-CPLR-FNPT-BR quick connects (for pressure washer only, not steam cleaning), B16/17 steam QC's (STEAM-QDCPLR). Please Note: Cover must be skived when to obtain proper coupling integrity if using economical or light duty "compress" style crimp fittings. Temperature Range: -40°C (-40°F) to +121°C (250°F) for water and up to +163°C (325°F) steam cleaner applications.